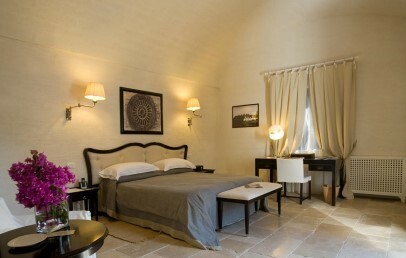 The Masseria Torre Maizza is located approx. 5 km from Savelletri di Fasano and the Adriatic Sea. The airports of Bari and Brindisi are both at about 50 km distance. The original architectural structure of the Torre Maizza farmhouse is at the centre of a large hillside estate, which overlooks the Mediterranean Sea, and just 1.5 km away from the coast. You will find the farm set in a grove of age-old olive trees and can enjoy strolls through orchards, vineyards and fields of other crops. Torre Maizza is an ancient garrison, part of a defence line that crossed whole Apulia, from the Gargano promontory to “finibus terrae” as Santa Maria di Leuca was once called. During the sixteenth century it was used as a watchtower against the raids of Ottoman and Saracen Turks, and it has now been converted into a refined, 5-star luxury resort. Local traditional hospitality, once provided to pilgrims and Benedictine monks, is now offered to guests. During August children over 10 years are welcome. 30 rooms and suites in total, distinguished between different categories and with the following facilities: free wi-fi and broadband ADSL connection in all rooms, extra large mattresses, goose-down pillows and duvets, bathrobes, organic pharmacy toiletries, LCD TV with satellite and music channels, Sky, CDs and radio, DVDs library, safe laptop-size. 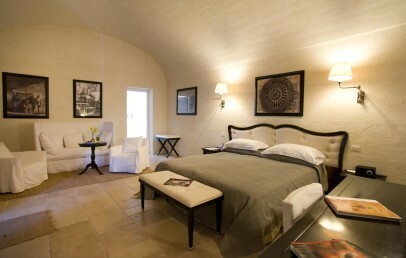 Superior and Deluxe – these rooms are under the cathedral vault ceiling, in typical white tufa dwellings, and guests will experience here the pleasure to live in an ancient farmhouse. Glimpses on the Mediterranean Sea from the window, framed by the colours of the olive grove and the grassy scent of the green golf course are the scenario to be enjoyed from each small terrace or window. All rooms have a double bed, a bathroom with bath tub and two couches and all feature typical farmhouse furnishings with hand-painted details. Deluxe rooms are larger than Superior rooms and are set in a better location. 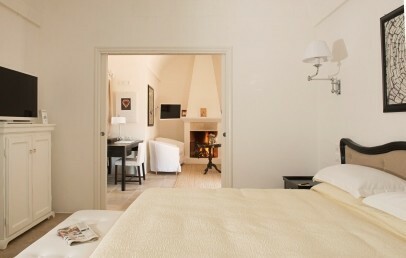 Junior Suites – are in an unique setting, completed by the romantic charm of a chimney, a Jacuzzi and a small terrace. Junior Suite Deluxe – are large rooms in order to offer more comfort to guests, whirlpool, a small garden, a miniature terrace overlooking the ancient olive trees, with the sea on the horizon, and the golf course for some time outside. 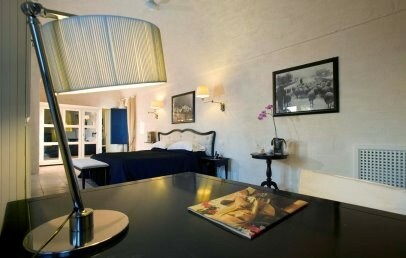 Suite dell'Ulivo – typical farm dwelling combined with the elegance of a modern resort. 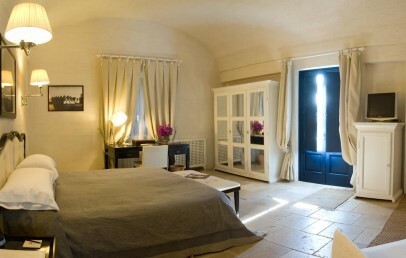 Bedroom and separate living room and a big terrace overlooking the olive grove and sea. Suite delle Palme and Torre Maizza – utmosst in terms of old and genuine country values, combined with the elegance of a modern resort. On the terrace overlooking the green olive grove, guests can fully enjoy a unique experience, using the private Jacuzzi pool and relaxing on the sun beds. At 5 km distance from the Masseria is the Coccaro Beach Club, with a long stretch of white sandy and fine beach. The Beach Club offers a terrace in teak with white curtains and gazebo, a restaurant and sushi bar, a lounge area under the palm trees, wellness pavilions behind the dunes for massages and exclusive AVEDA treatments (to pay), a children's club and a boutique. For sports activities it offers a mini soccer field, beach volleyball court and equipment to get out in a canoe and paddle boat. The access to the Coccaro Beach Club (lounger, umbrella, beach towel) is included in the room price. Moreover it offers the possibility to use the free shuttle service, available on request. The beach club can be reached by bicycle (available at the Masseria) or with the own car (private parking of the Beach Club). Tennis court, horse riding, Golf Club San Domenico 18-holes, 5-a-side artificial grass pitch, quad bikes excursion, wind- and kite-surfing on the beach, go-cart track, champion-ship clay pigeon shooting range. At the restaurant you can enjoy outstanding quality for an unique experience. View on the ancient orange grove, scent of orange blossoms, and the star of the moment is the Mediterranean cuisine. A combination of tradition and creativity, attention to detail shows in the menu, which includes a selection of the most genuine ingredients from both the farmhouse organic fields and the region of Apulia. The restaurants and bars are Le Palme of Masseria Maizza, Egnathia at Masseria Coccaro, Cabana by the pool, at Coccaro Beach Club, different bars and il Cigar Lounge. The swimming pool is surrounded by the garden's old columns: a stretch of water lapping teak decking. Vineyards, olive trees and an ancient mulberry around the whirlpool facility, where heated water will guarantee sensorial indulgence during winter. Other services are: Coccaro Golf Club 9-holes, Beach Club Coccaro, cooking school, mountain bike rental, excursions with the private 14 metres yacht, beach volley court, footing trail. City tax – The municipality requires the payment of € 3,00 per person/overnight, for a max. of 3 consecutive nights during the month May, June, September and October. During July and August the tax is € 5,00 per person/overnight, for a max. of 5 consecutive nights. Children under 12 years are exempted. The tax has to be settled on spot. 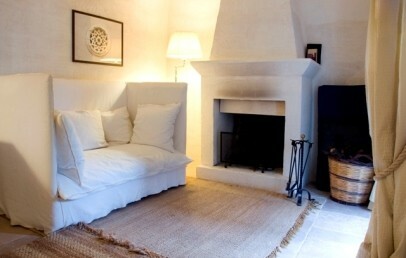 Romantic suite in typical white tufa dwellings and characterized by vault ceiling. There is a comfortable and spacious lounge area with sofas and fireplace. The bathroom is equipped with a Whirlpool-tub, bathrobes, toiletries. The Junior Suite has a private terrace equipped with sun beds. It offers a sea and olive groves view. 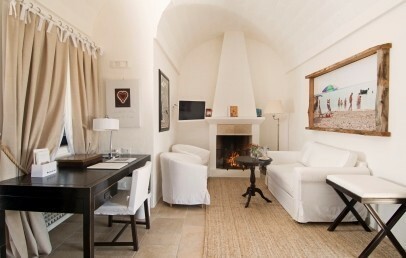 Double room in typical white tufa dwellings and characterized by vault ceiling. All features are typical farmhouse furnishings with hand-painted details. 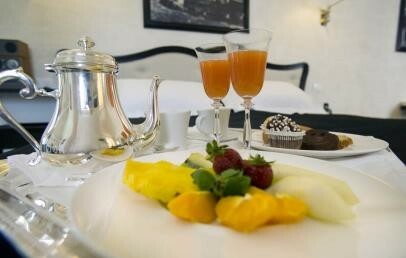 The rooms also have a little table and two easy chairs, ideal for the breakfast in room. The bathrooms are equipped with a big shower, bathrobes, toiletries. Some Superior are with terrace and all of them have a olive groves or golf course view. Large double room in typical white tufa dwellings and characterized by vault ceiling. All features are typical farmhouse furnishings with hand-painted details. The rooms also have a table and two easy chairs, ideal for the breakfast in room. The bathrooms are equipped with a bathtub, bathrobes, toiletries. The Deluxe rooms offer a private and manicured garden with sun chairs. 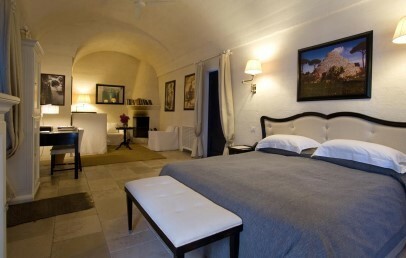 Romantic suite in typical white tufa dwellings and characterized by vault ceiling. There is a lounge area with sofas and fireplace. The bathroom is equipped with a Whirlpool-tub, bathrobes, toiletries. The Junior Suite has a private terrace equipped with sun beds. It offers a sea and olive groves view. 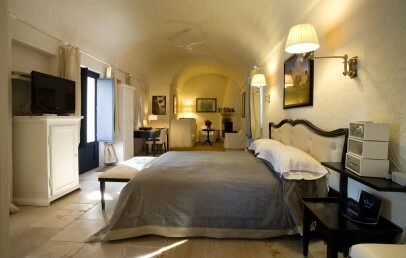 Romantic Suites in typical white tufa dwellings and characterized by vault ceiling. They have night zone and a lounge area with sofa and fireplace. The bathroom is equipped with a Jacuzzi tub, bathrobe and organic pharmacy toiletries. The Suites Palme and Maizza offer a big private terrace with heated pool/whirlpool and a wonderful view over the sea and olive grove. Comfortable outdoor sun beds and umbrella are available to enjoy and relax. Typical farm dwelling with white tuffs and characterized by vault ceiling. The Olive Suite has a sleeping area with a double bed and a separate living area with sofas and a fireplace. The bathroom is spacious with double sinks and whirlpool. The Suite features Sky TV and Tivoli stereo. Outside there is a large terrace with wonderful view over the olive trees and the sea and features comfortable sun loungers and sun umbrella to relax.